Mr. "I am the Law"
The second attempt at adapting the classic British comic book antihero Judge Dredd to film, titled just Dredd, is a vastly better movie than the last attempt, 1995's Sylvester Stallone vehicle Judge Dredd; but this is true of nearly all movies, which makes it a some pointless observation. Anyway, except for the name of the main character, and the basic idea of the costume design, there is absolutely nothing that the two movies have in common, which very much favors the new one (I have absolutely no familiarity with the source material, but I understand that it's also a great deal closer to the comics). And granting that "better than Judge Dredd" doesn't say much, perhaps this does: Dredd is good, actually. Shallow as all hell, but good; anyway, there are shallow films that are well-made and rewarding, and shallow films that are broken and inept, and Resident Evil: Retribution is still too fresh in the mind to simply ignore how much more successfully Dredd plays the same game: violence for the sake of it, depicted in frequent slow-motion shots that use 3-D to emphasise the texture and physicality of the destruction. Except that Resident Evil is deeply annoying, while Dredd is exciting and tense and, at times, reaches a kind of blood-spattered visual poetry. The world is just silly like that, sometimes. Unlike the exposition-besotted '95 film, Dredd plunges right into its narrative after a cursory explanation of where we are (post-apocalypse U.S., where remnants of humanity live in "megacities" dominated by huge towers called "blocks", which are basically like bigger, more industrial, more used-futurey versions of our housing projects), and zooms through the subsequent hour and a half with a gratifying singularity of purpose, refusing to stop (as, for some unknown & godforsaken reason, so many action films nowadays do) to elaborate on its plot and explore its setting. Indeed, Alex Garland's screenplay is noteworthy especially for how much it doesn't dawdle or wander: we get a really straightforward concept built into a three-act structure so classically arranged you could set your watch by it. Viz: the first sequence is menu, palate cleanser, and appetizer, all in one, introducing us to the grim, helmet-wearing Judge Dredd (Karl Urban), a supercop with no sense of humor and a sense of morality that is absolutely yoked to the hyper-strict rules governing his world, by means of a high-speed motorcycle chase that is one of the best action sequences I've seen this year for the reasons that a) it is cut together quickly, but without sacrificing continuity or spatial relationships, something that just about never happens anymore; b) it looks phenomenal in 3-D, as Dredd weaves in and out of the narrow spaces between speeding cars and the camera flies right in after him. After this quick introduction the movie, we're tossed into the happily unfussy main story, and we never leave until the very last scene: Dredd has been assigned to take a rookie judge, Anderson (Olivia Thirlby), out on her first day in the field, to assess her capabilities; they go to a particular block, Peach Trees, where there has been a gangland killing; the boss of the gang, Ma-Ma (Lena Headey), arranges to have the block locked down, requiring the two judges to fight their way up a 200-story structure to kill her for her crimes, and escape. That's it: just one long chase up a skyscraper, an idea simple enough to have served as the basis for one of the greatest of all action films, Die Hard, as well as the Indonesian The Raid: Redemption, which was in U.S. theaters earlier this year; it's also the central idea behind most of the brawler arcade games of the 1990s, which Dredd practically is already - it even has two playable characters. Like most simple concepts, when it's done well, it's done very well; and if Dredd is at heart just a mechanical device, clicking through escalating fight scenes at regular intervals, it's at least a particularly elegant machine. True, the film at times devolves into being nothing but an exercise in brutality, particularly during its slow-motion fights; see, the core of Ma-Ma's crime empire is a new designer drug, Slo-Mo, which reduces the user's sense of time passing (to 1%, we are told, but that's not what it looks like). Naturally, the popcorn movie coolness made possible by such a drug is not lost on director Pete Travis, who comes up with a really fine way of dramatising the effects of Slo-Mo by cranking up both the contrast and saturation of the image, while slowing the speed down to a crawl (and, as mentioned, using unusually aggressive 3-D effects) to settle us in the POV of the drug-addled thugs in Peach Trees; and since the only time we see them is when they're fighting Dredd, that means that we get many slow-motion sequences of people being shot, or battered, or in the film's most outrageously bloodthirsty moment, landing head-first after an extremely long fall and bursting apart like a rotten plum. At his most pornographic, Zack Snyder himself couldn't use slow-motion to such coarse effects. 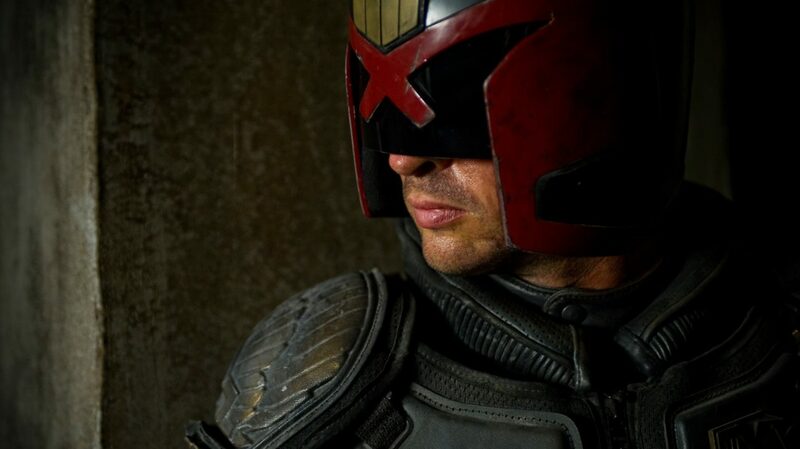 There's no defending Dredd on moral grounds: it lingers over, and fetishises, violent acts. But it does so with an uncommon amount of skill, and a really lovely sound mix that makes the violence more abstract and meaningless, if that's your thing. Which returns me to my initial point: shallow is shallow, but there's good shallow and bad shallow, and just because something is effervescent, does not mean it cannot also be well-crafted. And to be fair, the movie has its share of problems: Thirlby is absolutely dreadful, and Urban himself is only good in a very limited range (that we only see his mouth for the entire movie does not make his performance any richer or subtler), and his accent keeps slipping; the very first word in the whole movie, which he speaks in voiceover, is quite clearly "Ameriker" and not "America", though it never gets any worse than that, at least. The whole middle of the film sags a bit (not coincidentally, the part of the movie with hardly any slow-motion), as it becomes more of a skulking-through-the-building movie than a fighting-wave-after-wave-of-bad-guys movie, for about 20 minutes. Out of 95, aye; but a long 20 minutes. So not a masterpiece; not a great, defining action movie. But a good one, and a lot of angrily nihilistic fun, if one happens to be in the mood for that kind of thing. It is, anyway, a much better movie than its savage box-office reception (the clanking Resident Evil franchise can reach five entries, but this sleek beast of an action movie can't even turn a profit? Madness), and if its pleasures are ephemeral, they are still pleasures.